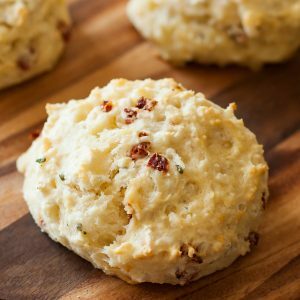 These easy cheesy biscuits are fluffy, flaky, and totally delicious! Combine flour, baking powder, basil, sugar and salt. Next grate cold butter over the flour mixture or cut it in using a pastry cutter, whichever you prefer. Add milk and sun-dried tomato and mix with a fork until incorporated. Once the liquid is incorporated into the biscuit dough, you should be left with super sticky dough. Add the cheese and knead the dough a few times in the bowl and then move to a floured cutting board or working surface. Knead the dough a few more times (not a lot, maybe 10 kneads total counting what you did in the bowl) and flatten. Cut out 8 fairly-thick biscuits or 10 shorter biscuits from the dough. No biscuit cutter? No problem! These work as drop biscuits too! Bake on the center rack on a baking sheet lined with a sheet of parchment paper or a silicone baking mat at 425 F for approx 14 minutes. FOR THE BASIL BUTTER: First allow your butter to soften. Mince/smash one clove of garlic and microwave it in olive oil (enough to cover garlic) for 30 seconds or so on 50% power to help infuse the evoo withthe garlic and amp the flavahhh. You can also simply saute it in a pan, whichever you prefer! Add the garlic and basil to your butter and whip using a hand mixer or a food processor, or even a good old whisk. (I used a hand mixer to incorporate a ton of air into the butter for super-fluffy results) All that's left to do is whip it and whip it good! Slather on your biscuits and store in an airtight container in the fridge. Biscuit nutrition facts below are an estimate provided by an online nutrition calculator; adjust as needed.